They came from Glendale, Arizona, and Loretto, Tennessee and Merritt Island, Florida, and Glenside, Pennsylvania, and points in between. Less than a year later, their names would be called by teams in St. Louis and San Diego and Washington, D.C., and Cincinnati and across the Major Leagues. But it was in a small city in northwestern Ontario that they put themselves on the international baseball map. For young ballplayers around the world, representing one's country is a dream. 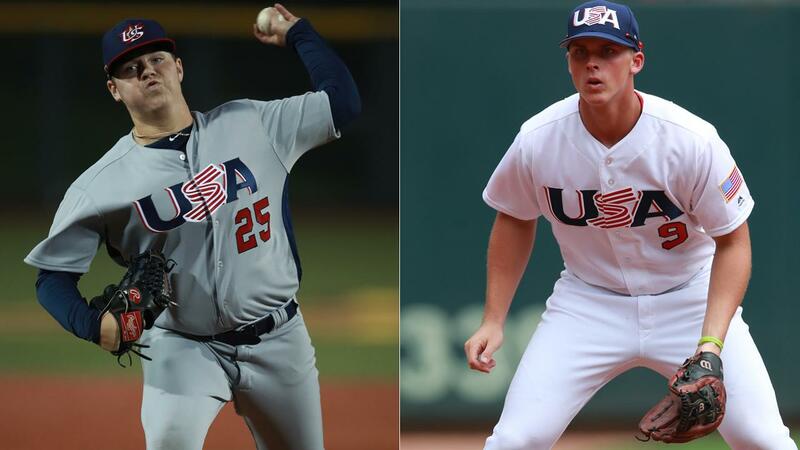 For teenagers like the Cardinals' Nolan Gorman and the Padres' Ryan Weathers -- who are among four Top 100 Prospects and a record 10 first-round Draft picks from the undefeated 2017 Team USA U-18 squad -- it was a chance make history. The selection process for a United States national team is exhaustive. Through a series of showcase events, National Team Development Programs (NTDP) and team trials, USA Baseball whittles a mass of the country's best players down to fewer than two dozen. "It was extremely difficult on the pitching side," Matt Blood, the 2017 U-18 national team director, said of building that year's roster. "On the offensive side, we had a few injuries ... and it got pretty cut and dry at the end. But on the pitching side, that year was an unusually deep group of pitchers in the whole country. We probably had five or six pitchers that maybe in a normal year would have made the national team, but in that year they did not." USA Baseball named its final roster for the 2017 U-18 World Cup on Aug. 24, the culmination of a final six-day trial featuring games between two teams of prospects at Target Field, home of the Minnesota Twins. "We could've had two first teams go [to the World Cup]," said Weathers, one of eight pitchers to make the final roster. "Making it, it fuels your fire to know that you're one of the best 20 players in the country and USA [Baseball] wanted you on that team to represent the country." For Gorman, a third baseman, the chance to play for the United States was years in the making. "Being selected for the U-18 team to go to Canada was unbelievable," he said. "I think I was 14 and went to an NTDP, trying to get on the 15U national team. I ended up being a reserve. ... I'd been trying for a while. I got to 18U, and it was a dream come true. Everyone loves to wear that USA across their chest, whether it's on the field or when you see people around in jackets or T-shirts. It's unbelievable." Featuring 14 other players making their national team debuts, the squad swept four exhibition games -- two from junior college powerhouse Iowa Western (5-1, 4-1) and one from each of two Minnesota travel ball teams before heading north. Already, they knew their group was special. "It took a couple games for all of us to really understand how everybody played," Weathers said. "I know I had some trouble at first. I felt awful if I gave up that first run or something, because there were other guys that were going out there and shoving every game. I just had to realize we had so many good players on the offensive side, it doesn't matter what I do. I know they're going to score a bunch of runs. For a pitcher, that feels really good. When we played at the Twins' stadium against Iowa Western, that's when you saw our team come together as one." Those games told Gorman something, too. "I knew Iowa Western was a good team going into it, a highly ranked JuCo team," he said. "The way our pitchers shut them down and with our offense kind of being able to get it going, that was probably the moment I realized that we've got a really special team." They were the team to beat when they arrived at Thunder Bay, Ontario, on the shores of Lake Superior for the 28th installment of the World Baseball Softball Confederation's U-18 World Cup in September. "We were going in as the fourth [USA Baseball] team trying to win a gold medal in a row," said Gorman. "We kind of knew we had the 'X' on our back. Everyone was against us." Two years earlier, eventual first-overall MLB Draft pick Mickey Moniak led the United States to a world championship in Japan. In 2013, a USA squad led by another eventual first pick, pitcher Brady Aiken, took the crown in Taiwan. The edition prior, it was a title in South Korea behind names like Christian Arroyo, Cavan Biggio and Stephen Gonsalves. The standard was set. No team had won four straight U-18s since Cuba in the mid-1980s. "Since we were in Canada, I think most of the fans were kind of with us but at the same time they would've loved to see us lose," Gorman said with a laugh. After routing the Netherlands, 11-1, to open the tournament on Sept. 1, US pitchers threw three consecutive shutouts in wins over then world No. 1 Japan, Mexico and South Africa. Wins over Cuba and host Canada put the Americans into a showdown with a loaded Korea team with a spot in the world championship final on the line. "Whatever country you're from, you think you're the best country there, but we ... told ourselves, 'We're not going to be beat,'" Weathers said. "The first time we played Korea, they threw a guy [Baek-ho Kang] who was a first-round pick in the [Korea Baseball Organization], and we knew that guy had the stuff to beat us and it was going to be a close game. We wound up winning [2-0], but we knew going into that game, that was the game to win. That would really show whether USA Baseball was the real deal, facing a first-round pick from another country." Kang was far from the tournament's only elite talent from outside the States. Japan's roster featured eventual Nippon Professional Baseball first-overall pick Kotaro Kiyomiya, a hulking, power-hitting first baseman. Netherlands pitcher Donny Breek inked a deal with Minnesota. Italian first baseman Leonardo Seminati had already signed with Cincinnati and took part in that year's instructional league. Korean shortstop Ji-Hwan Bae agreed to a contract with Atlanta during the tournament (a deal later voided as part of the club's 2017 penalty for violating international signing rules). Still, the Americans stood above the rest. "Just the pure dominance of the pitching and the defense was as good as I've seen," Blood said. "If the ball was hit in play, it was an out. And our guys threw strikes. We didn't give them baserunners. We didn't make errors. It made for really easy baseball to watch, because these guys, they took care of the ball. They dominated on the mound. Those two aspects complemented each other really well to make it really difficult to score on us." In their club's unbeaten run through the nine-day tournament, the American staff -- including not only Weathers but Matthew Liberatore (now the Rays' No. 5 prospect), Mason Denaburg (Nationals' No. 4) and Ethan Hankins (Indians' No. 3) -- combined to surrender just three earned runs, strike out 101 and walk 29 in 77 innings. They yielded just 34 total hits, only eight of which went for extra bases (all doubles). "It made it super-competitive, and that competitive aspect helped us out more than anything," said Weathers, who went 2-0 with 12 strikeouts over 9 2/3 scoreless innings of relief. "We just didn't want to be beat, and we definitely didn't want to be the one to give up the runs and break the line. It was a lot of fun going into every game knowing that you knew what your goal was, and your goal was to throw zeros up on the board." With Gorman and Brice Turang (Brewers' No. 3) on the left side of the infield, Anthony Seigler (Yankees' No. 5) behind the plate, Triston Casas (No. 5 in the Red Sox system) at first base and Jarred Kelenic (Mariners' No. 2) in the outfield, the US defense made it easy on the pitchers. "That was probably the best defense I've played in my life," Gorman said. "You look at our lineup, we've got probably four or five guys that could hit 25, 30-plus bombs in the big leagues one day. At the same time, our defense made [just four] errors. They say defense wins championships, and that's kind of exactly what we did." The offense held up its end, too, with a .274/.416/.377 team slash line and six homers. Going into the rematch with Korea for the title of world champion, Team USA had outscored the opposition in Thunder Bay by a margin of 53-5. "I think after the national anthem, we were looking at the trophy and telling the guys, 'That's our trophy. Nobody's going to take that from us,'" Gorman said. "We had a lot of confidence going into it even though we did just beat that team, 2-0, which was our tightest game. At the same time, we had our No. 1 guy on the mound, Matthew Liberatore. I was his roommate, so I knew he had complete confidence going into it. We're best friends, so I knew exactly what he was doing all night. He was visualizing and dreaming about that day. He didn't get as many strikeouts as he wanted to that day, but he let the defense work." Jolted by a monster homer from Casas, the U.S. busted out in the middle innings on the way to an 8-0 win, the team's sixth shutout in nine games. "We got the first two outs and then struck that last guy out and dogpiled everybody on the mound. ... I was just so in the moment and so happy for me and everybody else around me about what we had just done. It was hard to breathe, definitely, especially with a couple of guys just continuously jumping on the pile, but it was such a special moment. You get up and see your fans all taking pictures, taking videos, you get all these American flags you can wear around, take pictures with. It was awesome. Dream come true." "We knew going into that game, that whole entire crowd that was there, they were going for Korea. Our fans were really our parents," he said. "It was just amazing. ... Words can't describe how that felt." The Americans took their place atop the podium, bent their heads for gold medals, raised their trophy and went home. "It doesn't really hit you until after," Gorman said. "Some newsletter came out and had the title 'Dream Team.' Seeing that and knowing you were part of that and that's what people thought of the team you were just on, that's just something that you can never forget." With commitments to major college programs already in-hand for virtually every player on the roster, focus turned toward the next Major League Baseball First-Year Player Draft. Of 19 eligible players on the US roster, 17 were selected. "We had 10 first-rounders [in the 2018 Draft], but I think you're going to see we had a few more that are going to [go in the] first round after they get out of college," Blood said. "There's still Cole Wilcox and Kumar Rocker and Landon Marceaux and Joseph Menefee. Those guys all went to school, and they're all going to be right in that mix whenever they come out." Weathers went seventh overall to San Diego, where he's the system's No. 10 prospect. Gorman was taken 19th overall and is the Cardinals' No. 2 prospect. The third baseman made it to Class A Peoria in his debut campaign, one of only seven first-round high school hitters to reach full-season ball in the last decade. "It was something that baseball players don't get to experience all the time," Weathers said. "When the Draft settled down and you see nine of your other boys that went in the first round, there's no words that can describe that. We had talent all over the field, and when we got to Team USA we were all one team playing together, playing with a little chip on our shoulder, playing for our country."